So as the title says, I went to Marrakech for a total of 48 hours (give or take maybe so as not to be pinickety). Would I recommend you do the same? No - because you absolutely need longer in this mesmerising, amazing place. But sadly 48 hours was all I had on this trip so I made sure I soaked up enough Moroccan sun and funnily enough, I had one of my all-time favourite press trips. I visited Marrakech on behalf of the Royal Mansour - the most impressive hotel I’ve ever stepped foot in - alongside a trio of lovely journalists who came as part of the trip too and it wasn’t long before we felt like we knew each other and were having the best time of lives, being let loose in what was, quite literally, a palace. For a change, I took too many photos but as you scroll through you’ll soon understand why. Having visited Marrakech only once before and absolutely falling head over heels for it, it had long been on my bucket list to stay at Royal Mansour. It is literally a hotel like no other. In fact, it’s a palace, built at the behest of Morocco’s King Mohammed VI. He imagined a ‘medina within the medina’ and that was exactly what was built over three years from conception. For me, the hotel stands alone in its own league of hotel - it simply cannot be beaten. And I’m not alone in thinking this; celebrities, rock stars, even the King’s own guests stay here. It truly is a place fit for Royalty. Marrakech can be a hectic place. The medina is a noisy, chaotic sensory overload. But as soon as you arrive at Royal Mansour, all that is forgotten instantly. It’s serene, tranquil and a total haven which feels a million miles away (yet you can walk to the hustle and bustle in less than 10 minutes). Upon entering the palace, (I can’t bear just to say ‘hotel’) you step into the courtyard (the first picture in this post), a glorious, magnificent sight that makes you drop your jaw instantly. The details as you walk around are astounding - you almost forget you need to check in and there’s a room waiting for you. And by room, l of course don’t mean just a room. Rather your own private riad, of which the Royal Mansour has 53. Mine was one of the more ‘standard’ riads though certainly not to be scoffed at. Three storeys high with a private pool and sundeck on the roof, this place took heaven to a new meaning. Entering through a tranquil courtyard of your own, you have a lounge and relaxing area on your first floor; then bedroom, walk-in wardrobe and bathroom on second; rooftop on third. And get used to the exercise because you’ll be so excited by each floor you’ll spend the first hour up and down, up and down. The riads at Royal Mansour are magic, I can barely describe them. And fascinating too. 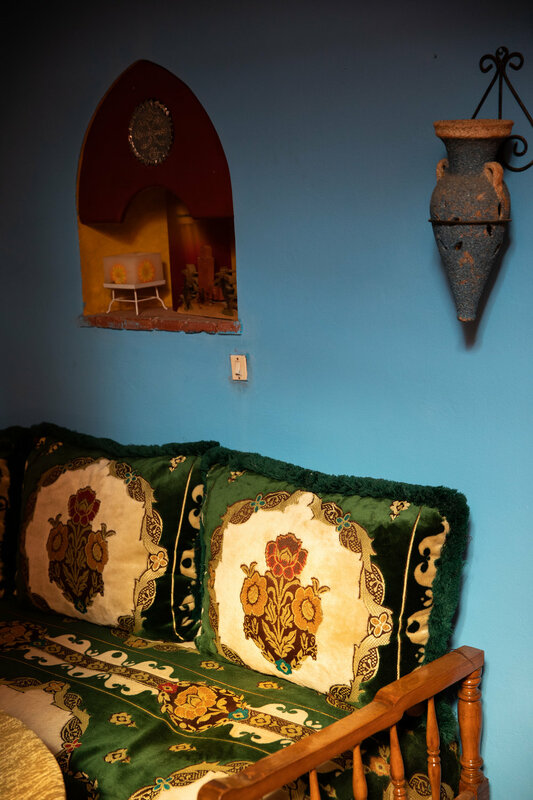 Though you will hardly ever see any staff, they are always around operating in tunnels below (each riad has no less than 10 staff), making sure beds are turned back at night, leaving treats in the lounge, clearing away breakfast (which you simply have to have by your pool in the mornings). They even have their own entrance into the riad through doors that lead you to the tunnel. And don’t worry - if that creeps you slightly, you can lock the doors! With just 48 hours here, understandably we didn’t leave the hotel much. You just wouldn’t if you were staying here. You want to soak in as much of this maybe once in a lifetime treat as you can and that’s exactly what I attempted to do. And you needn’t worry about being bored, because that’s the last thing you’ll feel at the Royal Mansour - I mean, even the walls can keep you entertained with all their detail. You have a number of restaurants at your disposal. My favourite being Restaurant Le Jardin for an al fresco situation and Le Grande Table Marocaine for a traditional Moroccan affair. And if you’re visiting for Sunday you absolutely must do the Sunday brunch at La Table and go hungry! You will want at least ten courses, I assure you. They allow non-guests at in the restaurants too so one to bear in mind, even if you just came to oogle at the hotel. Finally, there’s a spa. The I-have-no-words-to-explain-its-beauty spa. In fact, just scroll down. And book yourself a Sisley facial because that truly is amazing or opt for the spa’s signature hammam treatment. Royal Mansour is out of this world magical. And even if you were just to experience it for a night (because yes, it is pricey) it absolutely worth it. Once you arrive at Royal Mansour, you leave your life behind and enter somewhere so enchanting, you won’t believe it really exists. Since my first visit, Marrakech has been one of my favourite destinations - I could go every year for the rest of my life I think. We actually went on the first weekend of December, which I would really recommend as the weather is beautiful and warm - a much needed escape from cold London, that’s for sure - and what I’m most pleased about is that we got to see the hotel’s Christmas decorations bloom over night. If you want to see what I’m talking about - check here. Stay at Royal Mansour twice, perhaps? The final part of this blog post relates to one of the activities we did outside of Royal Mansour but one very kindly organised by the hotel and one which, can be arranged for guests staying at the hotel too. Something I cannot recommend you do enough. It was a day I’ll never forget and one of the best experiences of my life. I urge you to do it should you find yourself heading to Marrakech. Be sure to book a trip with Insiders Experience. Quite simply, you will not regret it. You are picked up from the hotel in your sidecar and driven off into the Atlas Mountains. That alone is breathtaking enough; the views are incredible. 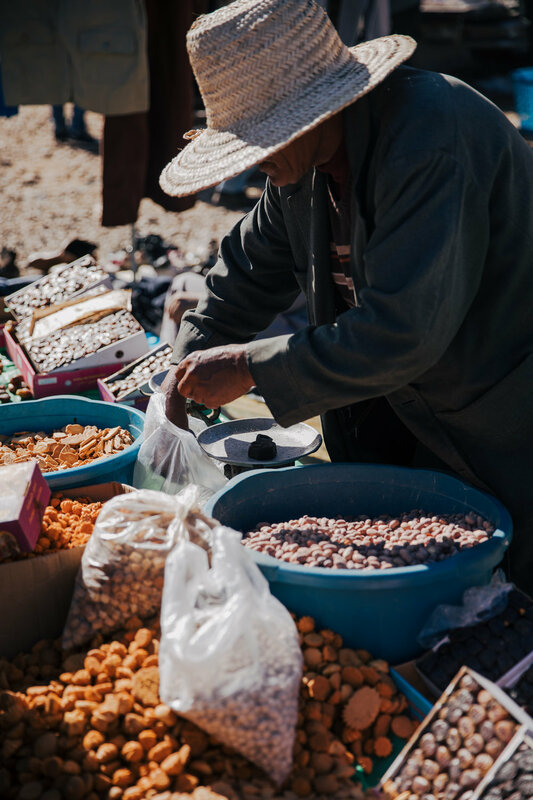 But as an added extra, you visit a local Berber village for lunch, visiting homes and seeing what daily life is like; visit a traditional Berber village and stop for the most delicious Moroccan mint tea made my locals (and pick up a ginormous pack of dates! ); and finally, you explore the beautiful landscape, stopping along the ways for the most jaw-dropping of vistas. I could go on and tell you about everything in detail, but I don’t want to spoil anything so I’ll let my photos below tell the story for me and I just hope you book yourself a trip. I will be next time I head to Marrakech, that’s for sure. I can’t thank the Insiders Experience and Royal Mansour enough for this day, it was honestly one of the best I’ve ever had. And it’s nowhere near as expensive as you think it’s going to be so I can’t stress this enough - DO IT! Visit their website here - if you haven’t checked them out already!